So your first time client had a good experience, and walked out the door. How do you know if they will ever come back? I’ve got a few other tricks up my sleeve to increase the rate of return clients. Step 2 of the Salon Profit Circle is the Survey. In sales, they teach if the customer leaves without the sale (or pre-booking in our case) its over. While pre-booking is really important, you aren’t always able to get them on the schedule for next time. So, are you going to give up that easily? Nope! Because you always get the email and phone number of first time clients. Let’s put that email to use! We will follow up with a quick email thanking them for coming in and inviting them to fill out a short survey of their experience. The goal here is psychological. We want to use our email copy to help them remember the amazing experience they had with us. For some, that would be enough, but we don’t stop there! We ask them to do US a favor. This taps into the law of reciprocation. When we do something nice for someone, they feel the need to reciprocate. And when we ask to fill out a survey, it would be rude to not help out, right? When the first time hair client fills out our survey, it creates a sense of investment into the success of your business. They feel that you care about their opinion, and that they are now a part of the team. And remember what I said in the last lesson about asking questions. It shows that you care about their opinion, and think they have valuable information to share. A survey accomplishes this psychologically even though you aren’t asking them directly. It’s all about creating more connection and engagement, even after the appointment. Create an email to send within 24 hours. It can be personal or generic, but either way, make it warm, friendly and grateful. Let them know you had a wonderful time talking with them yesterday, and hope they loved the salon experience, and how their hair turned out. It only needs to be 2-3 sentences, then close out the email. But what about the survey? Glad you are tracking! After the closing, create a P.S line that says, “P.S. Would you be willing to do me a favor and fill out a short survey of your experience? It will only take about 2 minutes, and really helps us make sure we are staying on track. Click here to take the survey. The most urgent information is always in the P.S. line, and it is the last thing they will read, so there is a natural flow to click the survey link at the end of the email. Anyone who has an extra 2 minutes will love to “help you out”. We have found that the First Time Client Survey has provided us with excellent feedback, is a great way to encourage your employees, and gives us the opportunity to move them to step 3 of the Salon Profit Circle! A personal note is always the best, but when you begin implementing our digital marketing strategies, you will probably not have time to create an individual note for each new client. And that is why we automate it! 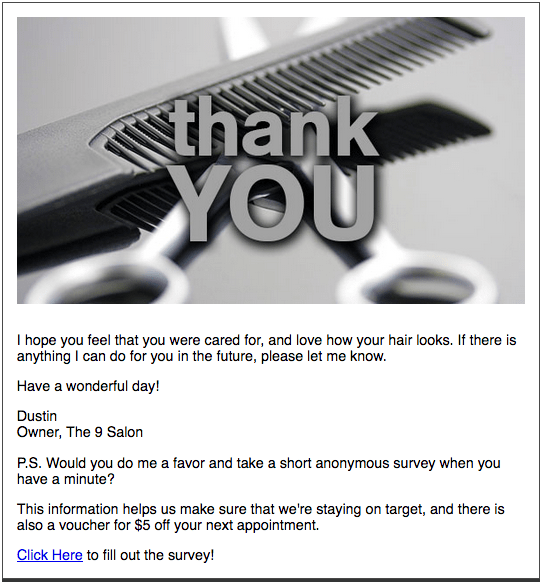 I have created a simple followup email with the link to the survey, and it automatically gets sent one day after each client’s first hair appointment in our salon. You are dying to know how? It is just one of the amazing tools embedded in the Salon Management Software we use! Click here and and then click the “Free Trial” button in the top right to try it out FREE for one month! This entry was posted in Salon Profit Circle and tagged client retention, client survey, followup email, salon marketing, salon profit circle. Bookmark the permalink.